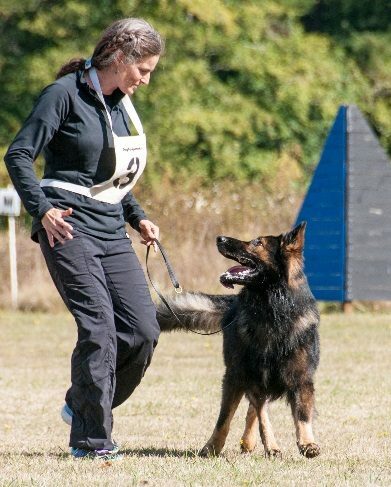 Shade is a Fenzi Dog Sports Academy Instructor, national level Schutzhund/IGP competitor, with experience in AKC obedience, French Ring, and high drive dogs of all types. She has a unique motivational approach that will bring out the desire in your dog to make correct choices in training, avoiding conflict and frustration in the training process. Shade brings a unique and insightful approach to utilising toy play in training; one that makes toy rewards true reinforcers to create reliable behaviours. Shade has been training and competing in dog sports since she was a child. 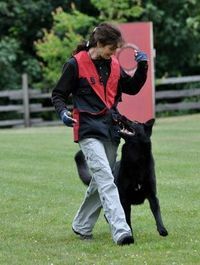 She has always been interested in how dogs learn, running her own successful dog training business since 1994, and has competed at the highest levels of IPO/Schutzhund, AKC obedience, and French Ring. This is an excellent foundation for students interested in creating a solid foundation for their dog for all sports. We create a thinking reinforcement, explore using marker cues, and teach how to create toy play reinforcement. Shade covers how to create the highly motivated heeling picture that I am known for using toy reward and food. Working dogs and handlers that will get the most out of this one day workshop are expected to have a solid operant shaping foundation, to have a dog that brings back and outs a toy with no conflict, and to be of a highly motivated personality. However, beginners are more than welcome to apply.